Updated March, 2009Hello! Thank you for taking the time to read about me. First allow me to introduce myself. My name is Patricia, my friends have always called me Patty, my family calls me either Mom or Grandma and most people that visit my website have become comfortable calling me Grandma. At my age I enjoy being called Grandma. I believe it shows respect and wisdom. I've been getting a lot of email lately from people all over the world concerned with worries about the economy, the security of their jobs, homes and family. They've been asking questions about my website, how I make money and wondering if they are capable of doing the same thing. The first thing I should tell you here is, I'm what is known today as a baby boomer. I was born after WWII and never experienced the Great Depression. My parents did, and they taught me to respect hard work, and to never take an education for granted. This is going to shock many of you but, if I didn't have access to the news and receive email from people worried sick about the economy I wouldn't even know there is a recession. You see, I started building my home business 4 years ago. Grandma's Wisdom is the second website I have built and I'm also working on a third. I'm not one to brag about myself but, since many people are asking, I feel I should tell you. I'm making a very comfortable income from what I'm doing. The recession that everyone is so worried about is actually making me more income. After all, people are staying home more and looking for ways to save money and earn an income. Now because Site Build It realizes the struggles people are going through today, they decided to give people a chance to start their dreams and build their home business and they made it very doable as far as the price is concerned. It's only going to be in effect for a short time, so now's your chance to build your dreams today. Just click on the link below and find out for yourself! I'm not going to lie to you and say it's all been easy for me, and it probably won't be for you. But when everything you need is handed to you, including a FREE step by step guide, it's all very doable. And here's something really exciting! Site Build It just started a new course called eLearning and you can actually take this 10 week course from the comfort of you home in your spare time. Geez, I sure wish I would have had to opportunity when I first started out. What is eLearning? Just click on the link and I'll tell you all about it. Besides Grandma's Wisdom, I have built two other websites. This has taken me a total of 4 years, but I've rarely spend more than a few hours a day working. Was it worth the time spent? You bet! I had my first website earning money within the first couple of months. If you'd like to see my other websites you can click on the links below. Of course you can do the same thing. Think about what are you passionate about. For me that question was easy. I love natural home remedies, organic plants, herbs and just making a home clean and comfortable without chemicals. My first website is about Pennsylvania, its history, the beautiful mountains and attractions that I love so much. My third website is a work in progress, it's about herbal remedies, the human body and what causes disease. What about you? Do you love art, music, writing or maybe exercise or sports? Your passion or knowledge can be about anything. What kind of work experience do you have? What do you dream about? Where do you live, do you find it unique and would love to share it with the world? You see, you can build your website about anything that interest you. Imagine setting your own hours, or taking a day off whenever you want or need to. Take a vacation or just enjoy a long weekend with your family and see your business still working for you and earning income, 24 hours a day, 7 days a week! That's what is known as passive income. I had a career as a Chiropractic Assistant and worked for a local Chiropractor for over 20 years. Even though I enjoyed my profession it was physically demanding. Several years ago I had an accident and injured my hip. After visiting several different kinds of Dr.'s and numerous tests, finally an MRI pinpointed the injury and I finally got a diagnosis. Now I'm facing an operation. I'm not worried about my business while I'm recovering, I'll just let it on autopilot, SBI will make sure it's running smoothly and I'll still earn a comfortable income. My husband is planning on retiring in 2010 and I realize if I wouldn't have started my home business when I did he wouldn't be able to retire for several more years. Physically I couldn't handle my job anymore. I believe things happen for a reason and I found myself craving the freedom and security only a home business can provide. I had no direction or idea where to start. I was cautious about getting suckered into those online "Get Rich Quick Schemes". That's what impressed me most about Site Build It. Right up front they let you know it's not a "Get Rich Quick Business". The formula SBI provides is a way to build a business slow and steady and learn as you go. You don't even have to join anything or pay a penny before you start learning. You can download SBI's Free eBooks right now if you want and you don't even have to give your email address. I started reading "SBI's Action Guide", then several more FREE e-Books they offered, the more I read the more impressed I became. If you don't like to read SBI now offers a free an Audio Guide. And if you feel you would rather be taught by an expert, they are even offering a new program called, eLearning. Here is where you'll have an instructor guiding you every step of the way. 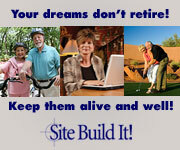 Or you can even have an SBI expert build your SBI site for you. So you really have no excuse for having a business of your own. Isn't it what you have always dreamt about? Below you'll find a link to download the FREE "SBI ACTION GUIDE". Just download this e-Book to your computer then print it out, grab your favorite drink, prop your feet up and enjoy. I'm sure you'll be as impressed as I was. Take a few minutes of your time today and take a tour of Site Build It. You'll see for yourself how easy it is to build your own home business online and how SBI will show you the formula and give you the support to make it all worth a couple hours a day to build a website that will give you security along with several streams of income that will last a lifetime. Like I said earlier, I'm from the Baby Boomer generation. Baby Boomers are retiring in record numbers every year. How many of us really have the IRA's and savings accounts to retire and enjoy our golden years the way we have dreamt about all our lives? Once you start building your website you'll see it isn't like working at all. It's fun to be challenged and creative. The rewards of a passive income is a sense of security unlike any other. Click on the link below and see how SBI has it all figured out for you. How Can A Stay At Home Mom Build A Home Business? Site Build It built a special section for Mom's. You'd be surprised to find out how many Moms and Grandmas are building websites through SBI and making a very successful home business. SBI even offers a special Masters Course for Mothers that's absolutely FREE! You can download the Masters Course below. Through SBI you will actually get a college education at no charge and instead of getting a piece of paper when you're done, you'll own a business. Think about it. Who is going to offer you all this for less than $25.00 a month? That's less than you would pay to buy coffee on your way to a job that you most likely would hate! TRUST IN YOURSELF AND DARE TO DREAM! You only lose energy when life becomes dull in your mind. Your mind gets bored and therefore tired of doing nothing. Get absolutely enthralled in something! How Does Grandma Make Money? Most people ask me how I make a comfortable income Well, some people have products to sell online, others may have a service, while others may have no desire to sell anything. For me, I chose to have several streams of income. 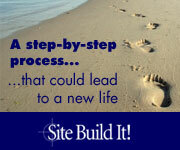 No matter what direction you choose to take your website SBI has the proven formula to show you how to earn an income. At this time you may be wondering, "If I have nothing to sell how will I make money?" You may have noticed, I don't sell anything on "Grandma's Wisdom." But I do sell ad space to Google and Infolinks. I also have a couple of affiliate programs. Every time someone buys I get a commission. They all send me a check every month. There are thousands of affiliate businesses, you just find what fits your niche. The point is, as much as the Internet has expanded and keeps expanding there is no way it's done growing. Technology is just getting started. The future is to get online and build your presence now. With the formula SBI has developed, the tools they offer, and the support you'll receive, I can't imagine what is stopping you. Below is a link to a FREE e-Book I paid $39.95 for when I first got started, "Make Your Site Sell", and it was worth every penny. These free E-books will not only teach you how to build a website, you'll learn how to write the content for the pages, how to get your website noticed, and how to make money. SBI offers many free eBooks to choose from. Why do they offer them free? Because they know once you read them you'll realize anybody can build a website, all you need is the desire. What Did Site Build It Do for a Grandma Like Me? Without the proven formula "Solo Build It" offers a Grandma like me I would have never been able to accomplish what I have accomplished. I now have a home business and an education that's in demand. Best of all, I have an income that keeps increasing day after day. If you're convinced that SBI is what you've been looking for, just click on the link below. If you would like to ask me something that concerns you, by all means fill out the contact form below and I'll get back to you. If you would feel more confident asking an SBI expert a few questions I provided a link that will take you directly to the SBI website. You only regret in life what you haven't tried, not what you tried. And don't forget, there is no risk involved if you do decide to try SBI. There is a 30-day full refund if you decide SBI isn't all I said it is.